Generation Squeeze (GS) is an advocacy group that has been around for a couple of years, but which has come to the fore more prominently as the Vancouver municipal election approaches. Their website describes GS as the younger generation’s version of the Canadian Association of Retired Persons. 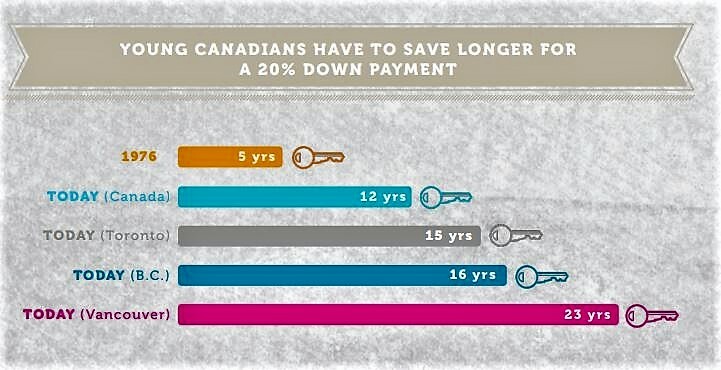 Their primary focus is on the difficulties younger Canadians have in the housing market, especially in Vancouver. In 2016 they produced a research and policy document called “Code Red: Rethinking Canadian Housing Policy” which I believe still represents their policy today. I have been reading the document and the following are my comments. For those still unclear on what the problems are for the younger generation, this will be a useful read and perhaps a necessary piece of education. Missing from this section is any analysis of (a) the consequences of enormous foreign capital inputs to the Vancouver market; and (b) the fact that Vancouver is such a low income city which, of course, has a direct effect on affordability. The GS paper goes on to discuss ten possible solutions, or at least routes to solutions. They are grouped into tax changes to moderate demand for housing, housing supply, and non-housing costs. First, they call for capital gains tax to be imposed on property transactions within 24 months at a sliding scale. This is something I have been calling for but I would stretch the time and keep the rate the same. I would impose capital gains tax on all property transactions, including “shadow flipping,” with a deduction equal to the general inflation rate for the period between sales, plus costs of genuine improvements, for at least five years. Then they propose a home valuation tax, a wealth tax on property. Seniors would be exempt and this tax would be offset against any income tax paid in Canada so it becomes, in effect, a tax on non-residents. The theory is that any collections on this tax would be paid into a Housing Affordability Fund. GS suggests a progressive tax based on median value in the region and suggests this would encourage developers to build housing at prices lower than the media value. This appears to deal with several problems at once but, frankly, it seems way too complicated and thus open to abuse. This wealth tax is expanded in their next point where they suggest that property wealth should be considered when deciding how much people (seniors mainly) should pay for services such as health care. They spend a whole page justifying this, but fail to convince that this anything but blatant ageism. And, if you are going to do this, why limit it to housing wealth? The ageism is expanded in their following point where they suggest that those under 40 should be exempt from such wealth taxes by the introduction for that age group of mortgage interest deductions. I happen to support mortgage interest deduction from income taxes; it works well in the UK and the US and many other jurisdictions to assist people get into the house purchase market. But basing it solely on age is simply discriminatory. It seems clear that they want to foster age warfare rather than, say, class warfare. Their final two propositions in the tax category once again attack what they see as advantages given to seniors (primarily the interest charges on property tax deferrals). They believe that these advantages should be transferred to the younger age group based on what I think is less than conclusive evidence that seniors are better able to pay than they used to be. The next section of the GS paper deals with Supply. Like other primarily supplyist groups, GS seem to believe that zoning restrictions in SFD neighbourhoods are the main cause of our housing problems. There is no recognition that only 16% of Vancouver’s “single family detached” houses actually house only one family. Nearly all of Grandview, for example, is already zoned as duplex, and a huge percentage have additional suites (legal or otherwise) which provide a good percentage of “affordable” rentals in the area. I have suggested ways in which Grandview’s density could be doubled without much additional building, and at costs far lower than new development. GS’s complaints that “modest-sized homes with yards are being replaced with very large single detached homes that fill entire properties” is definitely not true in my neighbourhood where “modest sized homes” with affordable suites are being replaced by unaffordable townhouses and the threat of exclusive condo towers that no young Vancouverite could possibly afford. However, in the following proposition calling for more rental accommodation I agree with GS’s observation that the building of condos in massive numbers under Vision Vancouver has significantly and negatively affected the availability of affordable rental. They call for “tax incentives” to persuade developers to create purpose built rentals rather than condos. However, there is no analysis of the failure of Vision Vancouver’s Rental100 incentives to create rentals that are actually affordable. Finally, they note the recent Federal and Provincial programs to put money into specifically low-income housing. They complain that, even with the billions being talked about, the number of such housing units will barely touch the need. However, I didn’t see any alternative suggestions from them. One of the important failures in this document is the lack of a definition of genuine “affordability.” This is a failure that seems to be endemic among supplyist groups, perhaps because developers don’t want to reduce their profits to achieve the affordability targets that would match Vancouver’s income levels. Without such an agreed definition, then, as famously defined by Councillor Kerry Jang, “affordable is whatever you can afford,” which helps no one, especially the low income younger workers, and leads to giveaways to developers for building studios at $1,500 a month. I have called Generation Squeeze a supplyist group on a number of occasions in this piece. That characterization is not immediately clear when reading Code Red. But the company they keep is illustrative. They have funding from the developers’ group, UDI, and I believe, directly from developers. Some might say, so what? But it is naive to believe that funding doesn’t influence policy — if that was not the case, there would have been no reason for the Provincial government to amend the Campaign Financing Act to rid our elections of big money. In conclusion, the policies listed in Code Red, and the age warfare that lies behind them, are a serious disappointment after the research that goes before. You are currently browsing the Jak's View of Vancouver v.3 blog archives for the day Tuesday, March 20th, 2018.